The introduction of the HP PCIe 8Gb Fibre Channel Host Bus Adapters brings datacenter infrastructure components to a higher level of performance and efficiency with the ability to deliver twice the I/O performance of 4 Gb FC HBAs. An 8 Gb Fibre Channel HBA purchased today is backward compatible with 4 and 2 Gb storage networks and will protect future investments. When using storage intensive applications, such as backup/restore, database transactions, virtualization, and rich media, the increased performance of the 8 Gb infrastructure enables more rapid storage and retrieval of critical information. 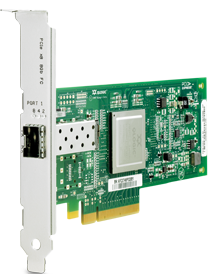 Finally, PCIe 8Gb FC Host Bus Adapters provide a number of features that work together to reduce power consumption, thus delivering a "green" benefit within the server.